Managers should make sure that employees just how their work is contributing. And, most importantly, managers should avoid actions that take away from the value of the work. Leaders or Coworkers dismissing/ignoring a persons work or ideas. Managers acting in a way that removes a persons sense of ownership of their work. Managers making employees doubt that their work will ever be used, which leads to employees thinking their work is a waste of time since it will never be implemented. Asking an employee to do work that is well below their capabilities. All of these things must be avoided and their must be consistent communication with employees tying their work to the success of the group. All the great inspiring leaders and organizations in the world all think, act and communicate in the exact same way, and its the complete opposite to everyone else. Every single organization on the planet knows what they do. Some know how they do it but very few organizations know why they do it. Making a profit is not a why, its a result. 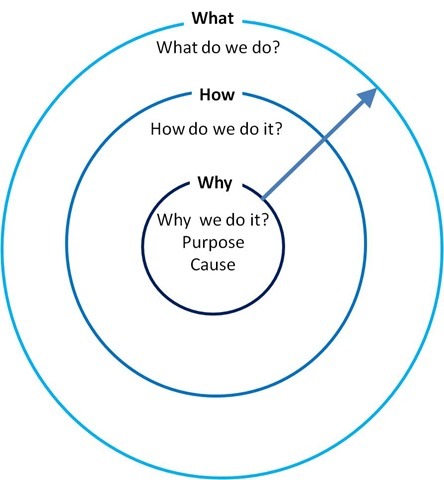 By Why we mean whats your purpose? Whats your cause? Whats your believe? Why does your organization exist? Why do you get out of bed in the morning? And why should anyone care? What: We just happen to make great computers. Start with Why: How Great Leaders Inspire Everyone to Take Action is available for purchase from Amazon.com at the preceding link.